Since most of the research has focused on gastric ulcers (rather than colonic), we know quite a bit about the factors that cause them. One of the major causes is inadequate access to free choice hay or pasture. Horses are meant to eat continuously, so their stomachs secrete acid constantly. When they are able to graze constantly they secrete saliva, which has a buffering effect on the stomach acid. Plus, the hay or grass forms a fibrous mat-like barrier between the acid in the lower portion of the stomach (where digestion is occurring) and the upper portion of the stomach, which cannot tolerate contact with the acid. The lower part of the stomach is protected by mucous while the upper part is not, so ulcers tend to form when acid moves into the upper portion of the stomach. A heavy exercise or training schedule can be another factor that can lead to gastric ulcers. When a horse exercises, he contracts his abdominal muscles, disrupting the protective fibrous mat in his stomach and forcing acid into its upper portion. Performance horses living in stalls may tense their abdominal muscles even when they are not exercising, since regular barn activities may prevent them from fully relaxing, especially if they are not offered free choice hay to occupy their time. In contrast, horses living in pasture move about slowly in a relaxed manner. A third cause of ulcers in performance horses is trailering. 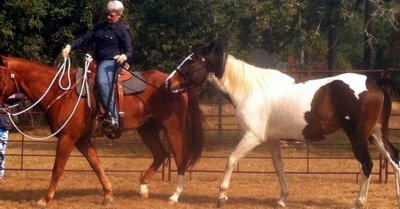 Horses must frequently tense their abdominal muscles to maintain balance in a moving trailer, which tends to have the same effect as heavy exercise. Since many people do not offer hay when hauling, their horses are faced with long, uncomfortable rides. It’s no wonder that many horses start kicking and pawing in the trailer! Finally, tightening the girth when saddling is another source of discomfort for a horse with ulcers. It can cause contraction of the stomach muscles, forcing the acid into contact with any existing ulcers and aggravating ulcer pain. When a horse must be kept in training, treating ulcers can be challenging. Most pharmaceutical products designed to treat ulcers act by blocking acid secretion. While this may be effective on a short-term basis, it eventually interferes with proper digestion and adversely affects the health of the digestive system. Keeping your horse in as natural an environment as possible is best, including offering free choice hay, building digestive health, and providing nutritional support so the body can rapidly heal the ulcerated tissue. For nutritional support, I like to feed Purina Equine Senior rather than grain and add regular New Earth Bluegreen Algae, which provide probiotics, digestive enzymes, and blue-green algae to support and heal the digestive system. I have also had success with a new product called SUCCEED, which is designed to support, protect and heal the digestive tract without interfering with normal acid production. I have done field testing with this product and have been very impressed with its effect on the behavior of horses with ulcers who had not responded completely to other measures. Whenever possible, keep hay in front of your horse so he has something to nibble on continuously. Noni juice is another good food-based nutritional supplement to help your performance horse handle the rigors of training and competition. The natural anti-inflammatory properties of noni juice allow the horse to recover faster and have less muscle soreness. Horses cannot use words to communicate with us so they have to send us signals when things are not right. How many times do we confuse their attempts to communicate with a bad attitude? When a horse is punished for trying to communicate it causes him even more stress and discomfort, and the downward spiral continues. How many good horses have had their careers cut short because of discomfort from ulcers? Try supporting your horse’s digestive tract and see how his performance and attitude improve.